On Dec 9, 2016, the Norwegian JRCC sent the "Barentshav" of the Coastguard to assist the "Kong Harald" which had suffered a power loss around 1 a.m. The ship, which had sailed from Kirkenes on Dec 8 at 12.30 p.m., was north of Nordkinn when there was a technical problem with one of its engines. Due to the bad weather with strong storm the master decided to notify the JRCC, which also put a Sea King rescue helicopter from Bristow in Hammerfest on standby in case it became necessary to evacuate passengers. The "Barentshav" escorted the ferry towards Honningsvåg. 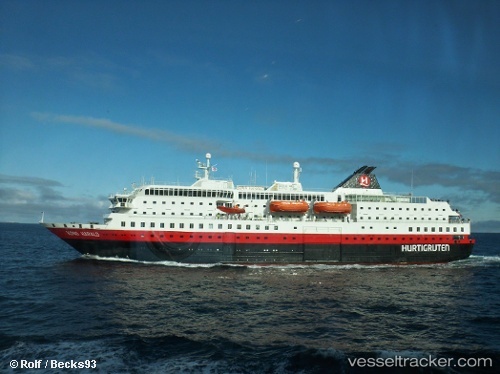 Now the "Kong Harald" was in the lee of the wind, but it was decided she would proceed directly to Tromsø.Both the hurtigruten ferries "Kong Harald" and "Spitsbergen" cancelled calls at the coast of Finnmark because of the storm.